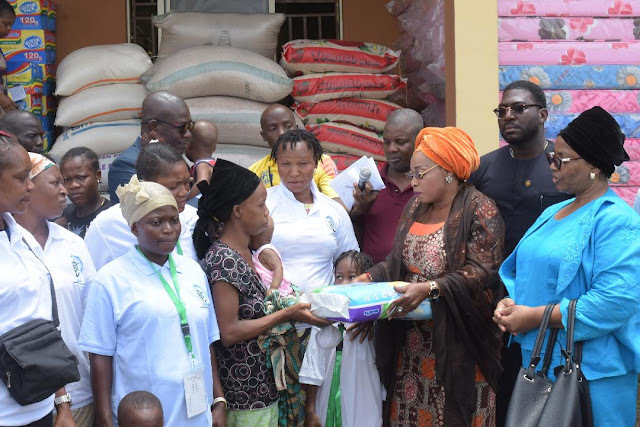 The Nigerian Maritime Administration and Safety Agency (NIMASA) has donated relief materials worth millions of naira to Internally Displaced Persons (IDPs) in Lagos. While making the presentation at the Lagos State Emergency Resettlement and ReliefCamp in Igando, the Director General of the Agency, Dr. Dakuku Peterside said that the gesture was in line with NIMASA's Corporate Social Responsibility (CSR) programmes part of which is anchored on the provision of safety nets for indigent and displaced persons. The Director General who was represented by the Director Special Duties (External Relations and Technical Cooperation) Hajia Lami Tumaka further said that the Agency has decided to identify with victims of natural and other disasters living in the camp in Lagoswith the intention of rendering assistance and giving them a sense of belonging. Speaking directly to the displaced persons, Dr. Peterside said“We have come here to identify with you and to share in your trying moments. Let me assure you that it will not be for long as the Government is aware of the challenges you are going through and is doing everything possible to get you properly resettled in order to lead normal lives again. "As a socially responsible corporate entity, we are concerned about your well being and we remain committed to partnering with the Lagos State Government to ameliorate your challenges". He further called on other well meaning organisations and individuals to also come forward with support for the victims of natural and other disasters while urging the Lagos State Government to remain resolute in its enforcement of the demolishing of weak buildings to avert further building disaster in the metropolis. Earlier in his welcome address, the General Manager of the Lagos State Emergency Management Agency (LASEMA), Mr. Adesina Tiamiyu commended NIMASA for consistently being a worthy partner in catering for the needs of the Internally Displaced Persons (IDPs)in Lagos. He applauded the kind gesture of NIMASA and expressed the readiness of the Lagos State Government to continue to partner with the Agency in the effort to properly cater for and resettle all victims of disaster in the state. According to him, “NIMASA has remained a worthy partner and we call on other agencies, corporate bodies and individuals to emulate this gesture so that in no distant time the IDPs can be resettled in their homes and continue with their normal lives and activities. I recall that last year NIMASA also brought a lot of relief materials to victims of flood disaster. So on behalf of the Government of Lagos State and indeed the displaced Lagosians, I say thank you to Dr. Dakuku Peterside and the Management of NIMASA”. Some of the materials donated by NIMASA include food items, clothing materials,beddings, toiletries, wheel chairs and baby food amongst other household items. It will be recalled that NIMASA had in 2018 donated relief materials to victims affected by floods and insurgency in 11 states of the country. The Agency is currently donating relief materials to victims of natural and other disasters in 20 states covering the six geo-political zones in the country. The exercise was flagged off in Lagos yesterday.